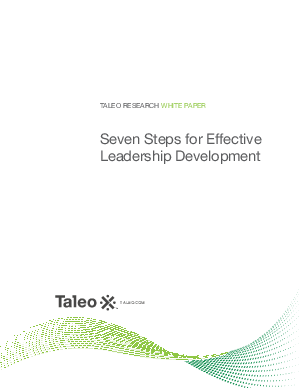 Seven Steps for Effective Leadership Development: Companies are not well prepared to fill vacancies in their leader¬ship roles. In fact, only 36 percent of organizations have programs in place to immediately fill leadership positions. Developing effective leadership using a consistent talent management program at all levels across the organization can return significant business value. To identify, attract, fill, and retain corporate leadership talent, companies need to focus on hiring strategies, employee development, and career and succession planning. Leadership development programs begin with alignment of leadership development to company strategy and follow seven steps to success.